Patch O' Pits Home Page!! 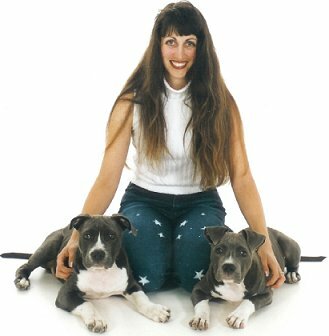 My little Patch O' Success is home to spoiled rotten, Grand Champion, Champion, Agility, and Therapy Certified American Pit Bull Terriers. Here looks, licks, and love are the priority in my never-ending pursuit for perfection in structure, movement, and temperament. All dogs are hand raised, kept indoors, and are highly socialized from birth. Patch O' Pits adheres to the UKC Breeder's Code of Ethics, and may produce an occasional well-planned litter. All prospective puppy owners will be thoroughly screened for compatibility with the breed. Puppy placements are made giving special consideration to loving indoor, show, obedience, and agility homes to maximize the full potential of each pup. This keeps both the owner and puppy happy. Please remember, adopting a puppy as a new family member is a full time responsibility and a huge commitment. All rights Reserved by Patch O' Pits. You may not copy anything from this site without prior written permission.